Despite their incredibly hard, protective shells, turtles and tortoises are on the menu for several predators. Indiscriminately and interchangeably called turtles, tortoises or terrapins by laypersons, all are members of a single lineage and are referred to collectively as chelonians. Young chelonians have the most to fear from predators; though, they become less vulnerable as they grow, humans, jaguars and crocodilians are important predators of adult tortoises. Humans are undoubtedly the most significant predator of adult tortoises. Humans have eaten turtles and tortoises for millennia; though aquatic turtles are more frequently offered for sale in the developed world, some primitive rainforest cultures appear to relish tortoise meat. The Galapagos Island tortoises (Geochelone elephantopus) are good examples of this; starting in the early 1600s, pirates began capturing and eating the large tortoises. 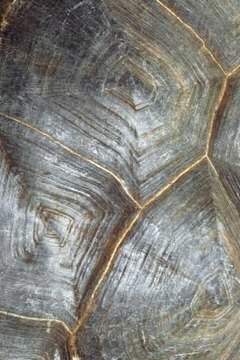 The pirates -- not known for their kindness -- would take the tortoises with them, as the tortoises wouldn’t die of starvation for months. The result is that three of the original 14 subspecies of Galapagos tortoise are extinct. While a variety of different large cats occasionally eat turtles and tortoises, jaguars (Panthera onca) are well-known for eating these well-protected reptiles. Jaguars often kill their prey differently than other big cats; rather than severing the spinal cord of its prey like a cheetah (Acinonyx jubatus) or lion (Panthera leo), jaguars often pierce the skull of their prey to kill it. This exceptional jaw strength helps jaguars to pierce the strong shell of tortoises. Jaguars vary in their preference for turtle meat; a 1987 study by L.H. Emmons, published in “Behavioral Ecology and Sociology,” showed that tortoises were one of the jaguar’s most important prey species in the Peruvian Amazon. Conversely, a 2003 study by John Polisar, et al., published in “Biological Conservation,” showed that tortoises in Venezuela were “virtually ignored” by jaguars. Crocodilians are important predators of aquatic or semi-aquatic chelonians. Additionally, some rainforest species -- like the dwarf caiman (Paleosuchus trigonatus) -- are terrestrial by crocodilian standards. These and some other dwarf crocodilians forage for food on land as adults and likely eat small, terrestrial tortoises. Armed with some of the strongest jaws on the planet, crocodilians can penetrate the shells of many turtles and tortoises. Young chelonians do not enjoy the same level of protection as the adults do; while adult tortoises are only vulnerable to those few animals capable of breaking through their shell, juveniles can be swallowed whole by some predators. Accordingly, snakes, fish, monitor lizards (Varanus sp.) and birds -- especially crows and their relatives -- consume juvenile turtles and tortoises. A 2007 study by Pablo R. Stevenson, et al., published in “Amphibia-Reptilia,” examined the population structure of yellow-footed tortoises (Geochelone denticulata) and concluded that predation on juveniles was one of the most significant factors in the species' demography. Along with monitor lizards, rats and pigs are important predators of turtle eggs. Can Animals Break a Turtle's Shell?